This policy will answer the most important questions about how we collect, use and store information about you. This is important to you – please read this policy carefully. This policy may be amended from time to time. Please visit our website www.seniordiscountsclub.comonce in a while – you will find the latest version of this policy there. 2. Who is responsible for protecting my information? 3. Which information and why do you collect about me? 4. Which information I have to provide you with and why? Please refer to the Answer to question 3 above – you have to provide us with the information which we need to provide you with the third party coupons, deals, advertisements, discounts, bonuses, freebies and other offers on our website (please see Par. 3.1 above). In case you do not provide us with this information, we will not be able to provide the services to you. 5. Do you share information about me? third party partners to verify your identity in connection with your use of certain aspects of the Services. When you request to match with a lender or credit card issuer for a Prequalified Loan Offer provide information to third party service providers. 6. How do you protect information about me transferred outside the European Economic Area? You may download a copy of the EU-U.S. Privacy Shield Framework at: https://www.privacyshield.gov/EU-US-Framework. 7. 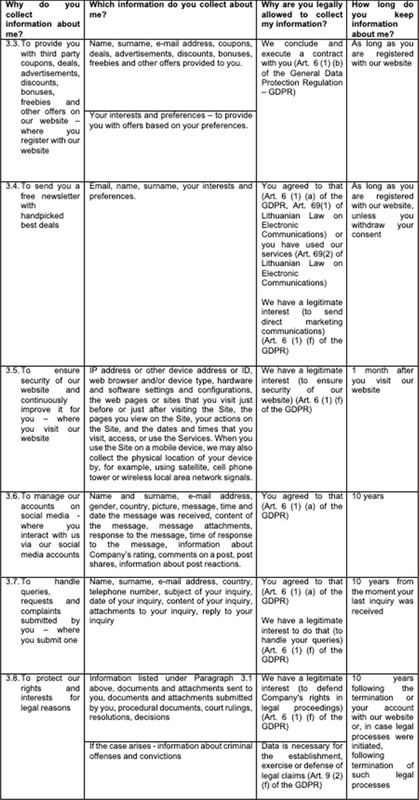 What can I do about my information at your company? To lodge a complaint with a supervisory authority and seek a judicial remedy. Yes. Cookies are small text files that are stored by your browser on your device (e.g. computer, mobile phone, tablet) when you browse websites. Other technologies, including data we store on your web browser or device, identifiers associated with your device, and other software, are used for similar purposes. They are widely used in order to make websites work or work in a better, more efficient way. In this policy, we refer to all of these technologies as cookies. 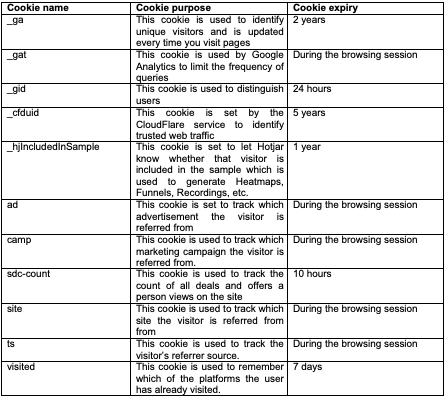 Our website leaves cookies as described in the table below. 9. How can I manage cookies? You can configure your browser to decline some or all cookies or to ask for your permission before accepting them. Please note that by deleting cookies or disabling future cookies you may be unable to access certain areas or features of our website. For information on how to adjust or change your browser settings, visit www.aboutcookies.orgor www.allaboutcookies.org.